It’s been a while since the last one of these, for which I apologise – it’s mostly been a case of too much hands on my time. This bills itself as “infused sparkling water”, which still meets the definition of “soda”. When I broke the seal and removed the cap, I was met with the characteristic odor of cucumber - not unreasonable, given the flavor. It wasn't intense, but then, cucumber simply isn't an intense flavor/odor. The flavor is complex. 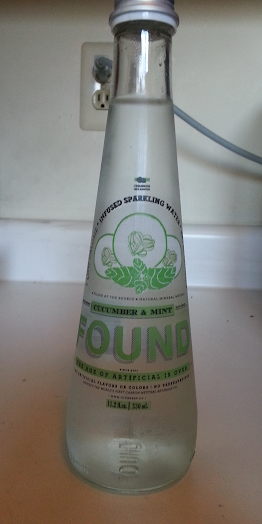 The cucumber is the single most noticeable flavor, but this is definitely a sparkling mineral water, rather than “regular” water, and the cucumber plus the mineral-ness almost completely overpower the mint. The sweetening is almost imperceptible, and probably does nothing more than bring out what little mint flavor can be detected. The carbonation is very light – there is a slight hiss and a few bubbles when opening the bottle, but afterward it appears to be still. You can still taste the carbonation in the tingle on your tongue, though. This is not really something that I’d specifically seek out, but it would be a reasonable choice to go with a salad – especially a greek salad – on a hot summer day. It might also be an interesting choice for the non-drinker at a wine-and-cheese party. I find this product at a food vendor in the Dining Court at Grand Central Terminal.